There are many reasons to visit TDS serving areas in Oklahoma. You’ll see one-of-a-kind places, visit historic routes, and you might even catch a glimpse of some very distinctive zebra-striped clothing. First, start in the upper corner of the state and visit Wyandotte (pronounced “why-n-dot”). This town of only 333 people is the tribal headquarters of the Wyandotte Indian Nation. But it also has another claim to fame—it also plays host to the world’s largest scenario game of paintball every June. 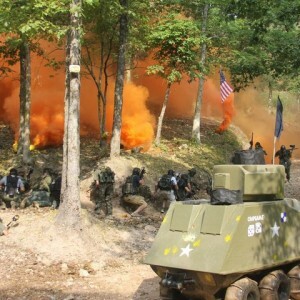 The game is called “Oklahoma D-Day” and it seeks to faithfully recreate battles from the real Normandy invasion on the 740-acre area called D-Day adventure park. About 350 players participate annually. If you drive a little bit southwest of Wyandotte you’ll come to Inola. A self-described “rural town,” it’s about two hours from Tulsa. Its name means “Black Fox” in Cherokee and the community also calls itself “The Hay Capital of the World.” The surrounding area is known for the bluestem prairie hay that’s grown in the fields. The hay apparently contains more minerals than hay from other areas of the country and is desired by major horse racing tracks across the nation. Of course, you can’t visit Oklahoma without doing a bit of traveling on “the mother road”—Route 66. This historic road cuts across the state, and passes through the TDS service area of Kellyville. Named for James E. Kelly who established a trading post in 1892, the town is now home to 1,150 people. Finally, if you’re a fan of Zubaz zebra-striped baggy pants, you’ll want to visit Choctaw. The oldest chartered town in Oklahoma, Choctaw is a stone’s throw from Oklahoma City and has hosted at least one Zubaz fan club gathering. It’s also known for its 7-day Oktoberfest event that happens under 30,000 square feet of tents. The famous author and Presidential Medal of Freedom winner Louis L’Amour lived in this historic city. He wrote more than 100 novels and 250 short stories. More than 320 million copies of his work have been sold across the world.